This is a list of Developer Materials owned by the project developer and/or 3rd parties. Such material generally is the property of developer/3rd party and only non-exclusive rights are normally given to the client for use of the material within the context of the project. For example, developer might use code fragments, web pages, photographs, graphics from stock photo CD's, etc. during the course of a project. tried writing my own contracts and found that I was taking hours to write things up and I was still forgetting to include a lot of aspects of the job at hand. So, in 2004 I took a chance and bought the Professional version of this product and I truly have not looked back. Highly customizable contract templates for practically any situation has really eased the process of what was previously one of the more painful aspects of my freelance work." This Schedule C (Developer Materials) (Can/UK/Aus) is included in editable Word format that can be customized in Word or by using the included Wizard software. The following is a list of pre-existing materials owned by "Developer" which will be used in the project. Describe each item to be included in the project owned by the Developer. The following is a list of pre-existing materials owned by third parties which will be used in the project. Describe each item to be included in the project owned by the a third party. 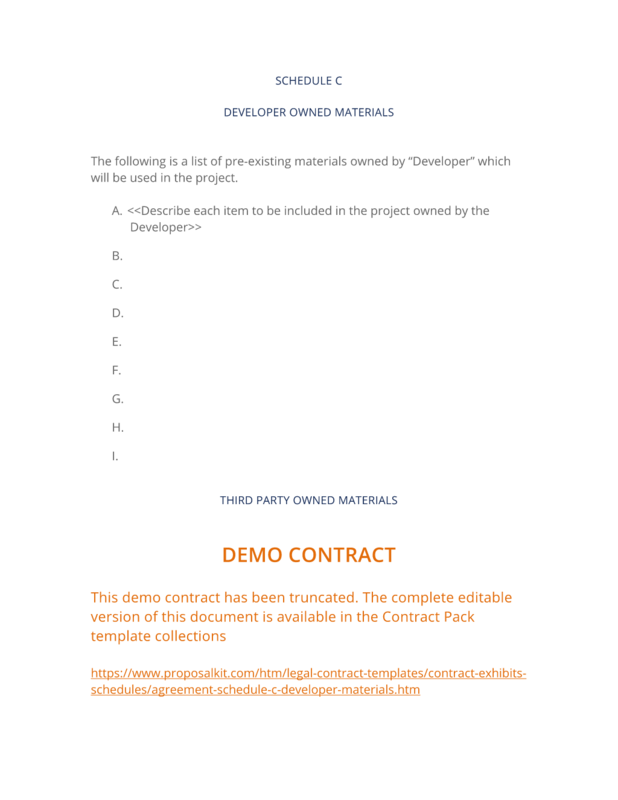 The complete Schedule C (Developer Materials) (Can/UK/Aus) - with the actual formatting and layout - is available in this Contract Pack.